As mentioned in this Wikipedia page, the term Brain-Computer Interfaces (BCI) was coined by Jacques Vidal, Emeritus Professor at the Computer Science Department - University of California Los Angeles (UCLA). Citing wikipedia, the professor produced the first peer-reviewed publications on this topic  and is widely recognized as the inventor of BCIs (...). Quoted Definition: "A brain-computer interface (BCI) is a computer-based system that acquires brain signals, analyzes them, and translates them into commands that are relayed to an output device to carry out a desired action." A quite similar research area is that of neuroprosthetics. In neuroprosthetics an electronic device is added to (connected to) the nervous system. The most common example is that of the cohlear implant. This bypasses all the ear biological structures (described at the relevant section of this site) and is connected directly to the nerve that transfers the auditory signal to the brain. "To learn more about BCIs, please read our BCI basics article." "Brain Bros: One Dude’s Mind Controls Another’s Gameplay Over Internet"
Let us consider that similarly to the example mentioned at this link and presented at the image above, you want to train for a task like "move ball up" or the task "move ball down". Explanation for the video: In the first part a training of this kind occurs. In the second part, the receiver subject (note that he has his back on the screen) has his finger placed loosely on the keybord. As his Brain Bro sends the command for motor action to the system, the signal is transferred to the coil of his headset and sends the motor command to move his finger. "...votre lointaine présence me conduit ce matin à vous parler d'une des choses les plus incroyables que j'ai vues depuis que je m'occupe de ce chronique". 1. A code or cypher is created. Two greeting words are coded, "hola" and "ciao". 2. The partipants learn this code. 3. The emitter subject in India wears a headset for wireless EEG. He moves his hands to represent a "1" and his feet to represent a "0". 4. 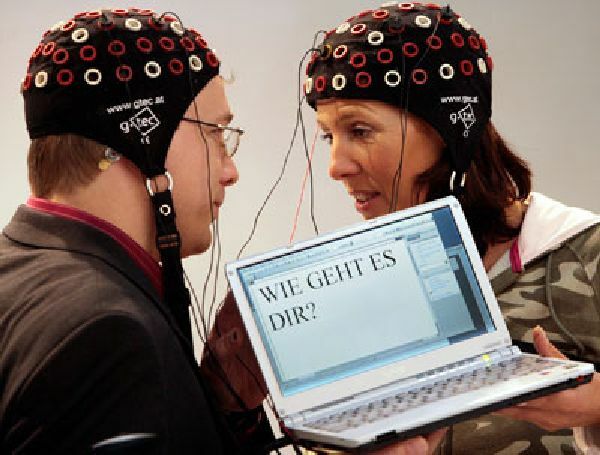 The intention of moving hands or feet and the moving action itself are captured in the EEG. 5. The signal is digitized and sent over the internet. 6. What reaction would you want an arriving signal to elicit to a subject? You wouldn't want to disturb him (with motor responses for example). A relatively innocent reaction is chosen such as the appearence of a light point. 7. If a person receives a hit on an eye he sees a light. This also may happen if we rub our eyes. Also in comics, when heroes get in fights and are hit we see little stars placed around their heads. The appearence (verb φαίνω) of light (φως) in this case is called phosphene. 8. How would a phosphene be generated normally? By electric activity activating the brain point for this response. In this case you also use electric activity to generate this response but from a distance, from the outside of the brain, targeting the specific brain point (which is known). As it has been described in the TMS section of this site, a magnetic field that changes with time induces electricity and this is the principle of the coil used in TMS. Given this, the arriving signal will be processed in such a way so that the 1 induces a phosphene via the coil and the 0 does not. 9. The receiver subject will receive a sequence of phosphenes and he must report yes when he perceives one and no when he does not. transmit= [1 1 0 0 1 0 1 1 1 1 0 1 1 0 1 0 1 0 1 0 1 0 1 0 1 1 0 0 1 0 1 0 0 0 0 1 0 1 1 1 0 0 1 0 0 0 1 1 1 1 0 1 1 0 0 0 0 1 1 1 1 0 1 0 11 0 0 0 0 1 0 1 0 1 0 1 1 1 1 0 1 1 0 1 0 0 1 0 1 0 0 1 1 1 0 0 1 0 1 0 1 0 0 0 1 1 1 1 1 0 0 0 1 0 1 0 0 0 1 0 1 0 0 1 1 1 0 0 1 0 1 0 0 0 0 0 0 1 1]. 10. The scientists reported that the experiment was successful and that the receiver subjects understood the two greeting words chosen. "fMRI as an unprocessed movie of the mind"
(Provides explanation of the study by researchers in Japan cited by wikipedia.